Chicken and Dressing Casserole | EASY AS PIE! I’m becoming painfully aware of how many casseroles I make! Yikes! I need to branch out. But, in the winter they are just so wonderful, comforting and hearty. And of course, they are easy too. I think it’s a requirement for being a Mid-westerner to make so many casseroles! This one is creamy from the soup and cheese, and yet very crunchy from the dressing. The chicken was very moist too. Place the chicken breasts in a greased 9×13 casserole dish. Place a slice of cheese on top of each breast. Pour on the soup and wine, trying to evenly distribute it. 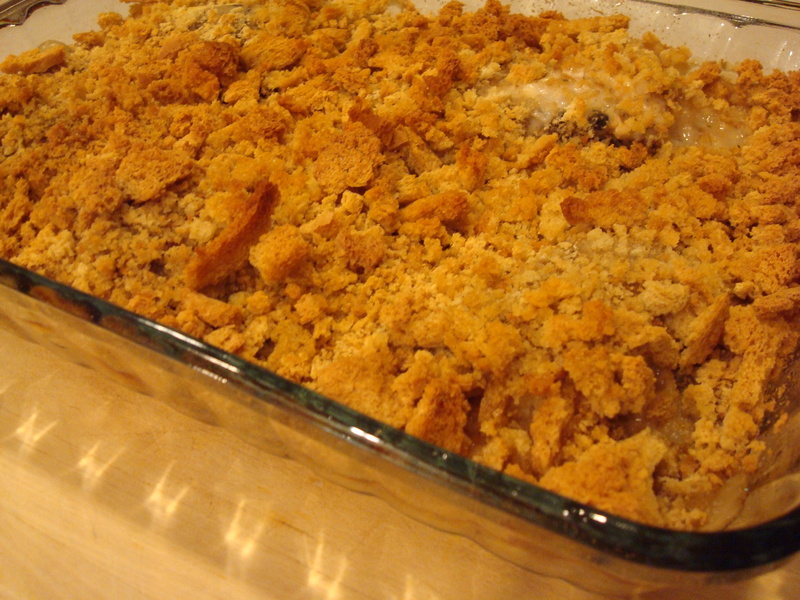 Sprinkle the stuffing crumbs over all. Drizzle the top with melted butter. Bake at 350 degrees for 1 hour to 1 hour and 15 minutes. Let stand 5-10 minutes before serving. Trackback: Honey Glazed Carrots « EASY AS PIE!